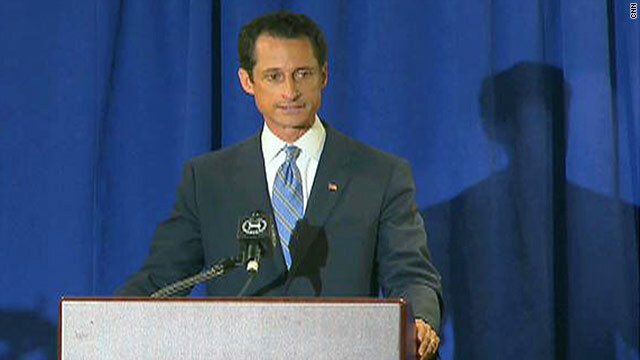 U.S. Rep. Anthony Weiner said he had inappropriate communications with about six women over the past three years. A photo that U.S. Rep. Anthony Weiner originally claimed was sent by a hacker was not, he said in a news conference Monday. "To be clear, the picture was of me, and I sent it," he said. He meant to direct-message it to a woman in Seattle, but he accidentally posted it publicly, he said. Patty said, "I guess if you want to be a politician, you need to have idiot in your resume! Another example of incredibly poor judgment by another politician that feels he/she is above and exempt from the law!" littlebit said, "At least he should have been smarter than to take a picture of himself, without the family pictures in the background. What is it with men in power with beautiful wives who cheat and then lie when they're caught even though there is always proof?" Chuck B said, "I am sorry I don't see the issue. Was the girl under age?" Me said, "The issue is the lying. Shows a complete lack of ethical standards." Rachel said, "If JFK were president today the press would have had a field day. I am so tired of these stories and I almost wish we could go back to leaving this kind of thing private." jane said, "Well at least he's not out there preaching family values and morality, but he's an idiot all the same, these men care less about how they make their wives look, or who they hurt. Pathetic." Lisa Allen said, "He is a human being and human beings make mistakes. We make mistakes every day. It's part of being human. I do not think the rest of his life should be ruined by one juvenile mistake." david F. replied, "Of course we all make mistakes, Lisa. Why, I bet most of us take pictures of ourselves in our underwear and send those pictures to young girls we do not know." Mike Hoff said, "Thank goodness our government is in the hands of responsible adults with impeccable character and judgment. I'll rest easier. Thanks, Weiner. Now go stand in the corner." Flying just isn't fun for most people these days. Longer lines and smaller spaces are shortening tempers. And baggage fees mean more people are trying to cram more carry-ons into the overhead bins. Many CNN.com readers said policies were not being enforced reasonably or fairly. OrangePekoe said, "So why can't they make everyone put their bags into the box that tells you whether or not it fits carry on? If it doesn't fit then it should be checked. " Dom0kun said, "The airlines should enforce their carry-on policies, for businesspeople as well as the lady returning from the shopping trip. Her oversized purse should count as one item, her Dollar Store bag as two, and her overnight as three." JimInBisbee said, "My personal peeve are the individuals at the back of the plane who, when boarding early, put their luggage in a bin near the front of the plane. Their strategy seems to be to walk up to the front of the plane as they depart and get their bag easily. I get steamed when I find my seat, with few people around it, only to find the bins are occupied." Some readers suggested the solution is to check just about everything. Bradwp said, "As a frequent business traveler, I won't carry anything on an airplane that I wouldn't also be willing to carry 5 miles across the Sahara desert. Therefore I'm a habitual bag checker. In my opinion, the airlines should swap their baggage collection process. Checked bags should be free; carry-ons should be $25." But imasunshin, another business traveler, said "Checking luggage is generally not an option. When I have a two-day trip, I cannot afford to have a bag lost for my entire trip. I have tried the checked-bag option in the past, only to have the bag lost for 36 hours." Czarina agreed, "It can be a big deal for people with meds, international travelers, and those with tight layovers." mgdvt said, "Eliminate the overhead compartments and only allow what will fit under the seat. Not only will it speed up boarding the plane but it will also quicken getting off the plane at your destination." JRJones21 said, "I carry a minimum of one small backpack that carries my most important camera equipment and laptop. It fits under the seat perfectly. This has always been enough carry-on for me, even on 22-hour trips to Asia. Why anyone needs to carry that much crap on board is beyond me." Only a decomposing body could explain the odor in Casey Anthony's trunk, a scientist testified Monday. Arpad Vass, a senior research scientist at Tennessee's Oak Ridge National Laboratory, said earlier that the presence of chloroform on a carpet sample from the trunk was at a "shockingly high" level. Anthony, 25, faces seven counts in the death of her 2-year-old daughter Caylee, including first-degree murder. PeteMD said, "Uh oh! She didn't account for the lies she would need to manufacture to get out of the forensic evidence. So, what other use would she have for the chloroform? And laser testing showing decomposition. Not sure what she has left to stand on." CanBear67 said, "The only explanation that really seems to make sense is that it was an accidental overdose of chloroform, (along with the duct tape to keep her quiet in case she woke up) so that she could go out and party. Had the defense just gone with that in the first place I think they could have avoided the death penalty." YabDabDoo said, "Could you breathe with duct tape over your mouth and nose? Could anyone? This was no accidental death." Guest said, "Yes, but I still don't see a cold-blooded killer in her. A mistake, negligence, foolishness, selfishness, bitterness, anger, recklessness, ignorance; I could see all of these. But not cold-blooded, intentional murder." YabDabDoo added, "Why are you saying that an ACCIDENTAL overdose of chloroform is the ONLY logical explanation? Remember, there was a search for "neck breaking" and "household weapons" on her computer. Also, someone who accidentally killed her child would typically not be happy enough to go to wild parties immediately after the accident." swampnole said, "There is some good news with this story. It's so obvious this girl killed her daughter that our country has become unified again. Unified with hatred and disgust for a child killer. Thanks, Casey!" So it's official. He's a pervert. he is human – just like all the other perverts in office! Bob? Barbara? banasy? My friend Robert who may watch me here without my knowledge? I'll have almost no time to post today. CNN's Toobin accused Breitbart of creating the Wiener incident and smeared Breitbart on a CNN broadcast. When will Toobin apologize to Breitbart now that the truth is out? Toobin! You have a lot of esplaining to dooo. GET OVER IT – He is human and he is male. Personal life and career need to be separate! Members of congress openly lie on the floor of the house on a regular basis and the House Ethics Committee does not take any action against them. Michelle Bachman openly lies on air to reporters and on talk shows and nothing is done to make her accountable. Why are they considering reprimanding Congressman Weiner? has anyone seen all the beautiful women that this guy has dated through the years? they are incredible. I want to know what is it that makes them date this man? i'm really at a loss of words. Your having rewarded Spitzer with a job on your 8pm spot. I am wondering how soon it will be before you add Weiner to your staff. You devalue those on your staff who are both capable and ethical. Its the lie. Its the ability to look at an interviewer or into a camera in front of millions of people and blatantly LIE. Why do we constantly excuse this? A lie about something incredibly stupid and juvenile, but we should continue to vote for this guy? Trust him to represent us regarding serious issues? Come on people. I am tired of listening about the Weiner issue. I personally saddened by his in actions. I think it inappropriate for to report more than the facts. You are suppose to be a NEWS organization. Lets get back to the news and stop the "what if?" When there are no facts supporting your position. Nothing new under the sun here. Uncontrolled testosterone has no political party; those in positions of power or trust are sadly all too common. The best statement from one who was caught recently was: "I did it for the worst reason – because I could." No need to mention the name, it applies to everyone and not for just this issue. Don't be a Weiner, didn't work for Brett, why would it work for you?? ?